Director of Best Practices and Performance at the Heart and Stroke Foundation of Canada. Objective To provide recommendations on screening for hypertension in adults aged 18 years and older without previously diagnosed hypertension. Quality of evidence Evidence was found through a systematic search of MEDLINE, EMBASE, and the Cochrane Database of Systematic Reviews (EBM Reviews), from January 1985 to September 2011. Study types were limited to randomized controlled trials, systematic reviews, and observational studies with control groups. Main message Three strong recommendations were made based on moderate-quality evidence. It is recommended that blood pressure measurement occur at all appropriate primary care visits, according to the current techniques described in the Canadian Hypertension Education Program recommendations for office and ambulatory blood pressure measurement. The Canadian Hypertension Education Program criteria for assessment and diagnosis of hypertension should be applied for people found to have elevated blood pressure. Conclusion After review of the most recent evidence, the Canadian Task Force on Preventive Health Care continues to recommend blood pressure measurement during regular physician visits. The Canadian Hypertension Education Program (CHEP) recommends that all health care professionals “who have been specifically trained to measure blood pressure ... accurately should assess [blood pressure] in all adult patients at all appropriate visits to determine cardiovascular risk and monitor antihypertensive treatment,”5 although no definitive screening interval is specified. Those with high-normal blood pressure should be reassessed annually.6 Evidence regarding the benefit of treatment forms the basis of this recommendation, but no specific evidence about the benefits of screening is cited. Previous Canadian7–9 and US reviews10,11 have focused on the indirect evidence for benefit from treatment and none have summarized the direct effects of hypertension screening on reducing blood pressure or cardiovascular outcomes. We sought to determine if there was any direct evidence of the effectiveness of hypertension screening using office and out-of-office blood pressure measurement in adults. Home blood pressure measurement in this context is not considered a primary screening test; however, it could be used as an adjunct in the diagnostic process. For this hypertension screening guideline, cardiovascular disease and morbidity includes stroke, heart disease, renal disease, peripheral vascular disease, and retinal disease. With respect to guidelines on the most appropriate methods for measuring blood pressure and for diagnosing hypertension, the CTFPHC defers to current guidance from CHEP to avoid duplication of effort. The CHEP recommendations have undergone critical appraisal by the CTFPHC to assess the quality of the guideline development process and have met our criteria for rigorously developed guidelines. The development of these recommendations was led by a CTFPHC working group, in collaboration with CHEP and the Public Health Agency of Canada. Only members of the CTFPHC were involved in the final voting for these recommendations. Hypertension analytical framework: This framework does not include management of diagnosed hypertension, as it is beyond the scope of the CTFPHC mandate. CHEP—Canadian Hypertension Education Program, CTFPHC—Canadian Task Force on Preventive Health Care, CQ—contextual question, CVD—cardiovascular disease, HTN—hypertension, KQ—key question. *Cardiovascular morbidity includes stroke, heart disease, renal disease, peripheral vascular disease, and retinal disease. †The recommendations will defer to CHEP for a description of the specific processes for taking office, home, and ambulatory blood pressure measurements. The CHEP recommendations were assessed based on the CTFPHC’s critical appraisal process,* which is designed to review and critically appraise the guideline development process from other organizations. A systematic review was conducted to examine the effectiveness of hypertension screening in primary care in reducing the risk of important patient outcomes of cardiovascular morbidity, and cardiovascular and all-cause mortality. The effectiveness of screening on reducing blood pressure (an intermediate outcome) and an examination of the harms of screening were also included. Critical appraisal of CHEP’s recommendations on methods for hypertension screening was conducted by the CTFPHC. 1. We recommend blood pressure measurement at all appropriate primary care visits: “Appropriate” visits might include periodic health examinations, urgent office visits for neurologic or cardiovascular-related issues, medication renewal visits, and other visits where the primary care practitioner deems it an appropriate opportunity to monitor blood pressure. It is not necessary to measure the blood pressure of every patient at every office visit. The frequency and timing of blood pressure screening might vary among patients. The risk of high blood pressure and the risk of stroke or heart disease change over a person’s natural lifespan and increase with age, comorbidities, and the presence of other risk factors. Therefore, screening frequency might increase accordingly, especially in patients with more than 1 vascular risk factor. Adults identified as belonging to a high-risk ethnic group (Southeast Asian, aboriginal, or African ancestry) might benefit from more frequent monitoring. Having recent consistently normal blood pressure measurements might decrease the need for more frequent monitoring, while a tendency toward high-normal blood pressure could indicate that more frequent monitoring is needed. Recommendations are graded according to the GRADE (Grading of Recommendations Assessment, Development and Evaluation) system,14 which offers 2 strengths of recommendation: strong and weak. The strength of recommendations is based on the quality of supporting evidence; degree of uncertainty about the balance between desirable and undesirable effects; degree of uncertainty or variability in values and preferences; and degree of uncertainty about whether the intervention represents a wise use of resources. Weak recommendations are those for which the desirable effects probably outweigh the undesirable effects (weak recommendation for an intervention) or undesirable effects probably outweigh the desirable effects (weak recommendation against an intervention) but appreciable uncertainty exists. A weak recommendation implies that most people would want the recommended course of action but that many would not. For clinicians this means they must recognize that different choices will be appropriate for each individual, and they must help each person arrive at a management decision consistent with his or her values and preferences. Policy making will require substantial debate and involvement of various stakeholders. Weak recommendations result when the balance between desirable and undesirable effects is small, the quality of evidence is lower, or there is more variability in the values and preferences of patients. Evidence is graded as high, moderate, low, or very low, based on how likely further research is to change our confidence in the estimate of effect. This recommendation is in part based on direct evidence from a randomized controlled trial that showed a community-based screening program that included a comprehensive cardiovascular risk assessment and education session reduced cardiovascular mortality, compared with usual practice (Table 1).15 After adjustment for hospital admission rates during the year before intervention, intervention communities had 3 fewer annual hospital admissions for cardiovascular disease per 1000 people 65 years of age and older compared with control communities. The risk of admission was reduced for myocardial infarction (relative risk [RR] 0.87, 95% CI 0.79 to 0.97, P = .008) and congestive heart failure (RR 0.90, 95% CI 0.81 to 0.99, P = .029), with non-significant trends toward decreases in stroke and cardiovascular mortality. Residents in the intervention communities were also more likely to start antihypertensive therapy (RR 1.10, 95% CI 1.02 to 1.20, P = .02) than those in the control communities who underwent usual screening practices. Evidence summary of benefits associated with hypertension screening: The mean follow-up was 1 y. Each end point was assessed using mean cumulative hospital rates from 1 RCT.15 There was no serious risk of bias in this trial. There are no concerns about lack of blinding, as blinding is part of the intervention and therefore there is no risk of bias. There was no serious inconsistency, as only a single study was used (inconsistency is not applicable). There was serious indirectness, as the study focused on the population > 65 y of age (although younger patients were not denied participation); therefore, the study results are not generalizable to the general population. In addition to hypertension screening, the intervention included comprehensive cardiovascular risk assessment and education sessions. The efficacy of hypertension screening in isolation was not directly assessed. There was no serious imprecision seen in the trial. There was an insufficient number of studies to assess publication bias. The study was of moderate quality and critical importance. This recommendation is also based on the substantial body of indirect evidence that demonstrates the benefits of treating diagnosed hypertension, whether mild or severe.16–18 One meta-analysis on the effectiveness of treatment of hypertension (which included 147 studies) found that lowering blood pressure by 10/5 mm Hg (the equivalent of taking 1 drug at a standard dose) could prevent 22% of coronary artery disease events and 41% of strokes in those aged 60 to 69 years.19 Previous guidance20,21 also used indirect evidence demonstrating that hypertension can be effectively diagnosed through office blood pressure measurements11 and that treatment of elevated blood pressure can decrease cardiovascular events11,20 as the basis for their recommendations. The working group identified and searched for literature on the following clinically important harms associated with screening: false positives, false negatives, anxiety, psychological effects, and economic costs such as lost time from work or lost insurance. We found no evidence to indicate that any of these clinically relevant harms result from hypertension screening,12 although we do acknowledge that no evidence of harm does not ensure that there is no harm. Recent evidence suggests that although pharmacologic therapy for early hypertension has common side effects, serious adverse effects are rare.10 An examination of the harms of treatment of hypertension was outside the scope of our review. Although we did not identify studies of patients’ values and preferences about screening for hypertension, in the judgment of the CTFPHC, blood pressure screening is an acceptable preventive intervention for Canadian patients. Experience from the Cardiovascular Health Awareness Program,15 which had no problems recruiting volunteers, also suggests that this type of screening is acceptable to the general public. This is a strong recommendation based on moderate-quality evidence. Recommendations from CHEP were assessed with AGREE II (Appraisal of Guidelines for Research and Evaluation)22 criteria and not with the GRADE (Grading of Recommendations Assessment, Development and Evaluation)23 criteria. The quality of evidence was determined based on the CTFPHC’s confidence in their estimates and the rigour of their guideline development process. 3. For people who are found to have an elevated blood pressure measurement during screening, the CHEP criteria for assessment and diagnosis of hypertension should be applied to determine whether the patients meet diagnostic criteria for hypertension6: The 2012 CHEP recommendations for assessment and diagnosis of high blood pressure were critically appraised by the CTFPHC to assess the quality of the guideline development process, and were found to meet the CTFPHC criteria for rigorously developed guidelines (see Critical Appraisal Results for details). * This is a strong recommendation based on moderate-quality evidence. Recommendations from CHEP were assessed with AGREE II22 criteria and not with the GRADE23 criteria. The quality of evidence was determined based on the CTFPHC’s confidence in their estimates and the rigour of their guideline development process. Practitioners should remain alert for opportunities to screen those who infrequently attend their practices and others who have not been screened recently. These patients are often younger, appear healthy, and might not have risk factors for hypertension or cardiovascular disease and therefore might be overlooked for screening opportunities. Limited evidence exists to demonstrate that screening for high blood pressure leads to improved cardiovascular and other health outcomes. However, substantial indirect evidence exists to demonstrate that measurement of blood pressure can identify adults at increased risk of cardiovascular disease, that diagnosis of hypertension leads to treatment, and that treatment in turn leads to improved outcomes. Awareness of hypertension status is high in Canada, which is probably because blood pressure screening has become a routine medical practice in recent years. Further research should focus on reaching populations who have less access to health care and as such are less likely to be aware of their hypertension or to have it appropriately controlled. Blood pressure measurement is recommended at all appropriate primary care visits. “Appropriate” visits might include periodic health examinations, urgent office visits for neurologic or cardiovascular-related issues, medication renewal visits, and other visits where the primary care practitioner deems it an appropriate opportunity to monitor blood pressure. It is not necessary to measure the blood pressure of every patient at every office visit. Blood pressure should be measured according to the current techniques described in the Canadian Hypertension Education Program recommendations for office and ambulatory blood pressure measurement. For people who are found to have elevated blood pressure during screening, the Canadian Hypertension Education Program criteria for assessment and diagnosis of hypertension should be applied to determine whether patients meet diagnostic criteria for hypertension. La traduction en français de cet article se trouve à www.cfp.ca dans la table des matières du numéro de septembre 2013 à la page e393. ↵* The Decision Table to Inform Hypertension Screening Recommendations, Critical Appraisal Results, and Detailed Methods are available at www.cfp.ca. Go to the full text of the article online, then click on CFPlus in the menu at the top right-hand side of the page.
. Blood pressure in Canadian adults. Health Rep 2010;21(1):37-46.
. Obesity and hypertension—the issue is more complex than we thought. Nephrol Dial Transplant 2006;21(2):264-7. Epub 2005 Nov 25.
. Impact of high-normal blood pressure on the risk of cardiovascular disease. N Engl J Med 2001;345(18):1291-7.
. Accurate measurement of blood pressure. Markham, ON: Hypertension Canada; 2011. Available from: www.hypertension.ca/accurate-measurement-of-blood-pressure. Accessed 2012 Mar 9.
. 2012 CHEP recommendations for management of hypertension. Markham, ON: Hypertension Canada; 2012. Available from: www.hypertension.ca/images/stories/dls/2012gl/2012CompleteCHEPRecommendationsEN.pdf. Accessed 2012 Mar 9. The periodic health examination: 2. 1984 update. Canadian Task Force on the Periodic Health Examination. CMAJ 1984;130(10):1278-85.
. Screening for hypertension in young and middle-aged adults. Edmonton, AB: Canadian Task Force on Preventive Health Care; 1994. Available from: http://canadiantaskforce.ca/wp-content/uploads/2013/03/Chapter53_hypertension_adult94.pdf. Accessed 2012 Mar 9.
, editors. Canadian best practice recommendations for stroke care. 4th ed. Ottawa, ON: Canadian Stroke Network; 2012. Available from: www.strokebestpractices.ca/wp-content/uploads/2012/10/20120BPR_Ch2_Prevention_Final-Version_20Sept-2012F-12.pdf. Accessed 2013 Aug 12.
. Evidence for the reaffirmation of the U.S. Preventive Services Task Force recommendation on screening for high blood pressure. Ann Intern Med 2007;147(11):787-91.
. Screening for high blood pressure: a review of the evidence for the U.S. Preventive Services Task Force. Am J Prev Med 2003;25(2):151-8.
. 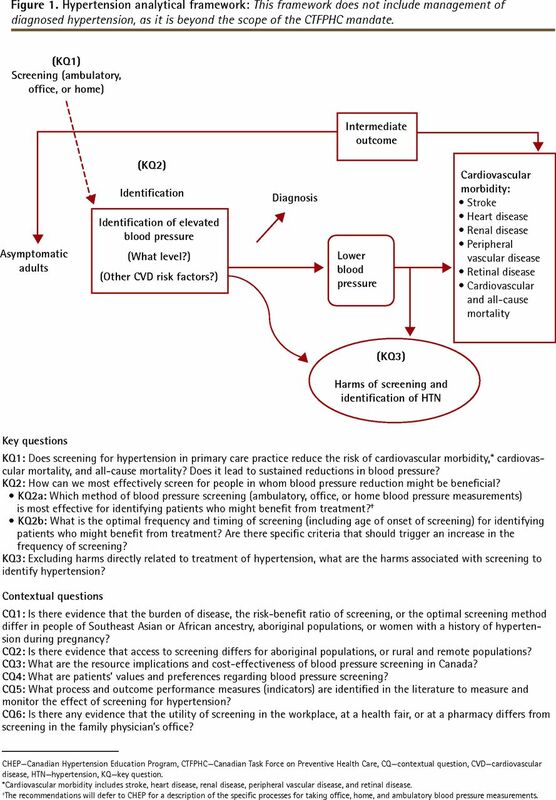 Screening for hypertension. McMaster Evidence, Review, and Synthesis Centre; 2012. Available from: http://canadiantaskforce.ca/wp-content/uploads/2012/10/HTN-Screening-EvidenceReview-Final.pdf. Accessed 2013 Jul 25.
. Process for guideline development by the reconstituted Canadian Task Force on Preventive Health Care. CMAJ 2012;184(14):1575-81. Epub 2012 Aug 13.
. Improving cardiovascular health at population level: 39 community cluster randomised trial of Cardiovascular Health Awareness Program (CHAP). BMJ 2011;342:d442.
. The seventh report of the Joint National Committee on Prevention, Detection, Evaluation, and Treatment of High Blood Pressure. Bethesda, MD: US Department of Health and Human Services; 2004. NIH publication 04-5230. Available from: www.nhlbi.nih.gov/guidelines/hypertension/jnc7full.pdf. Accessed 2013 Jul 18.
. Long-term absolute benefit of lowering blood pressure in hypertensive patients according to the JNC VI risk stratification. Hypertension 2000;35(2):539-43.
. Effects of ACE inhibitors, calcium antagonists, and other blood-pressure-lowering drugs: results of prospectively designed overviews of randomised trials. Lancet 2000;356(9246):1955-64.
. Canadian Hypertension Education Program: the evolution of hypertension management guidelines in Canada. Can J Cardiol 2008;24(6):477-81.
. Screening for high blood pressure: U.S. Preventive Services Task Force reaffirmation recommendation statement. Ann Intern Med 2007;147(11):783-6.
, editors. GRADE handbook for grading the quality of evidence and the strength of recommendations. The GRADE Working Group; 2009.
. Cardiovascular risk factors in ethnic populations within Canada: results from national cross-sectional surveys. Open Med 2010;4(3):e143-53. Epub 2010 Aug 10. First Nations Regional Health Survey. RHS phase 2 (2008/10) preliminary results. 2nd ed. Ottawa, ON: The First Nations Information Governance Centre; 2011. Available from: www.rhs-ers.ca/sites/default/files/ENpdf/RHSPreliminaryReport31May2011.pdf. Accessed 2013 Jul 18.
. A statistical profile on the health of First Nations in Canada: determinants of health, 1999 to 2003. Ottawa, ON: Health Canada; 2009.
. Hypertension in pregnancy and later cardiovascular risk: common antecedents? Circulation 2010;122(6):579-84. Epub 2010 Jul 26.
. Indo-Central Asian cardiovascular health and management program (ICACHAMP) [abstract 510]. Can J Cardiol 2008;24(Suppl SE).
. Tackling health literacy: adaptation of public hypertension educational materials for an Indo-Asian population in Canada. BMC Public Health 2011;11:24.
. Report from the Canadian Chronic Disease Surveillance System: hypertension in Canada, 2010. Ottawa, ON: Public Health Agency of Canada; 2010. Available from: www.phac-aspc.gc.ca/cd-mc/cvd-mcv/ccdss-snsmc-2010/pdf/CCDSS_HTN_Report_FINAL_EN_20100513.pdf. Accessed 2013 Aug 12.